What is the purpose of a Yellow and Black Water Base Plastic Chain Post? A Water Fillable Base Post can be used on its own with a sign attached or as part of a complete system linked by plastic chains. They serve to secure areas undergoing maintenance as well as manage queues of people or vehicles. The posts also act as holders for temporary traffic signs. 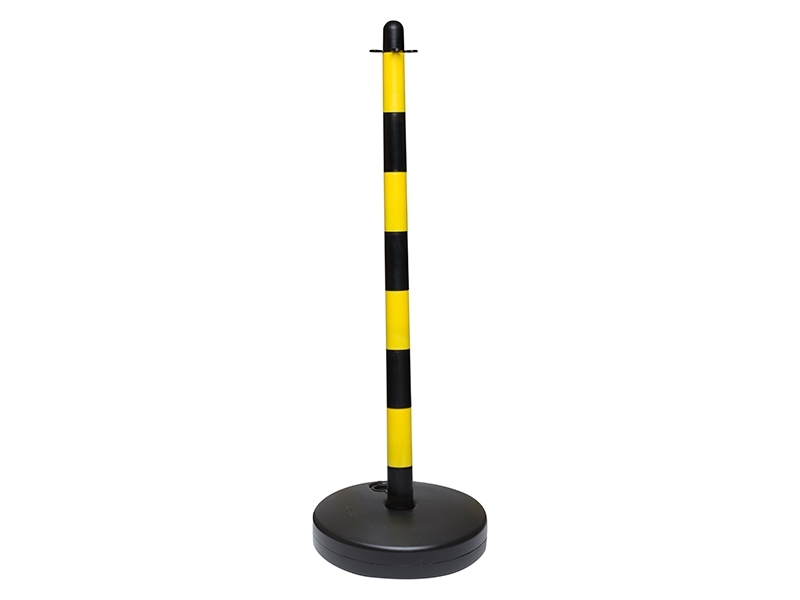 Plastic post and chain fencing make lightweight and handy barrier posts as the water-fillable bases weigh only 0.6kg when empty and 3kg when full. The posts are easily made visible with coloured plastic chain link. 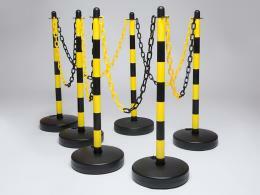 Where can a Yellow and Black Water Base Plastic Chain Post be used? A Water Filled Base Post can be used in commercial areas such as shopping centres, hotels and hospitals. They can likewise be used at activity centres such as concert venues, banquet halls and reception areas. 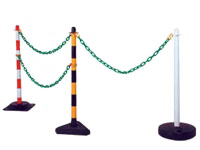 Schools can use the post and chain fencing to manage queues at canteens, libraries as well as entrance gates. Parks can use the kit for different purposes. The posts can be used to hold temporary safety signs or serve as barriers at indoor and outdoor car parks. It is always a good idea to have some of these posts at home for a variety of uses. The posts are 880mm (H) x 40mm (Dia) while the base is 300mm in diameter and is 75mm high.